Compact SUVs are the flavour of the times. Almost every new car buyer has his eyes set on buying a compact SUV. This segment has seen an advent of buyers from the hatchback and also sedan segments A beefy look and higher ground clearance are the major reasons why people are preferring compact SUVs over other vehicles, in a similar price range. 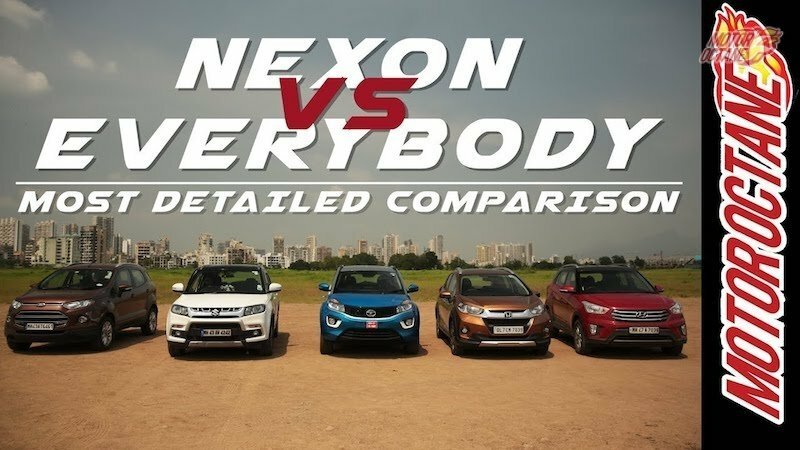 The Tata Nexon, which will be launched shortly will also compete in this segment, We pit it against some best selling compact SUVs and find out which one is the best for you. 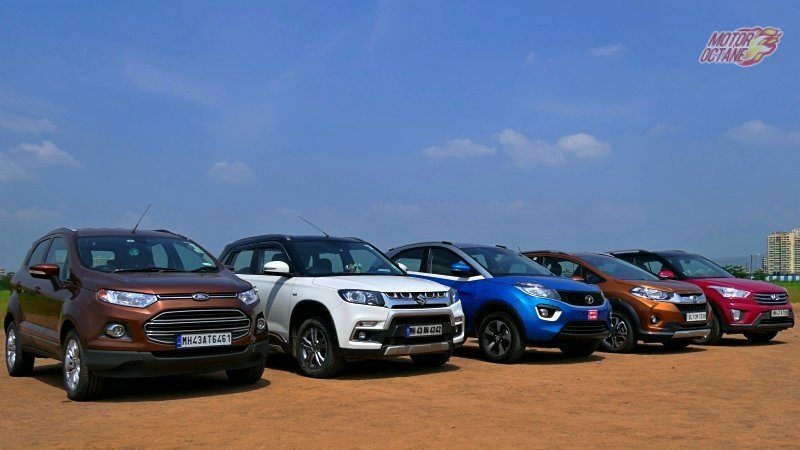 Read on further in our Tata Nexon vs Ford Ecosport vs Maruti Vitara Brezza vs Honda WRV vs Hyundai Creta Mega Comparison. Design is a subjective aspect, hence, the evaluations are not based on the looks of these SUVs. All of these vehicles are good looking and do not look like oddballs. It really depends upon what kind of look you prefer. The Ford EcoSport is the oldest SUV here. It carries a proper boxy SUV styling with a very aggressive looking front end. The styling of the Ecosport is one of its biggest USPs and the reason why it went on to become so popular.It is well proportioned and has a raised look with enough muscular appeal. The rear and the side also compliment the front. It comes with 16-inch alloy wheels and looks tough. The Maruti Vitara Brezza is also a boxy looking SUV that is quite traditional. It has been styled to look attractive with the front end having a thick chrome grille. The side is squarish in appearance and there’s a quarter window at the rear. The two-tone colour lends it some flavour. The rear is simple and not very attractive. This also comes with 16-inch alloy wheels. The Honda WRV is Honda’s first attempt at a compact SUV. Technically based on the Jazz, it has similar proportions inside-out, however, the WRV gets very different styling that makes it look aggressive and mean. The front end is spruced up with a lot of cladding and thick chrome bar in the grille. There is cladding all over and the tail lamps are C-shaped ones that differentiate it from the Jazz. In fact, its overall styling differentiates it from the Jazz in a big way and it looks good. 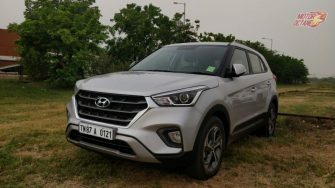 The Hyundai Creta, though from a segment above, is a part of this comparo because of a lot of enquiries that we got about comparing it to the rest of the compact SUVs. 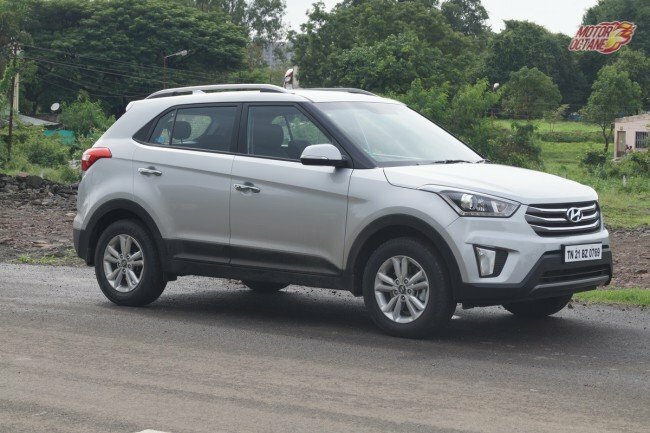 The Creta is a good looking vehicle based on Hyundai’s Fluidic design language, though it has traditional SUV looks and proportions. It is specifically designed to look more urban and less rugged or in-the-face. The Tata Nexon is the new kid on the block here and takes a very different route as far as design and styling go. The design is more like a crossover than a traditional SUV and follows the IMPACT design language of Tata Motors. It gets a wide front grille that extends upto the headlamps. From the side it looks like crossover and has interesting styling elements that include combination of three colours. The rear is also stylish with attractive tail lamps. Out and out it is a head turner and looks different from the rest of the pack. As far as looks go it’s entirely a personal choice and you may choose one which you prefer. Interiors are very important as this is a place where you will spend most of the time with the vehicle. What one looks for is comfort mainly and utility along with is ease of operation. The Ecosport interiors are attractive and towards the funky side. The Ecosport is the oldest of the lot and though the interiors feel good, they have now started to appear dated compared to the rest. It gets a lot of buttons and it also has a touchscreen system now. 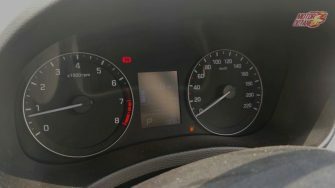 The dashboard resembles the Fiesta which has been discontinued. A new Ecosport is expected to be launched next year, which will have all new interiors. EcoSport is a comfortable vehicle and the seats are very supportive. It’s a good place to be in, because you can achieve a good desired driving position ,not only because of the seat height adjustment but also because the steering can adjust for rake and reach as well. The build quality also could have been a little better, when we talk about touch and feel. At the rear the EcoSport is comfortable and the seats offer good support. The highlight is that the backrest can tilt to offer enhanced comfort. The leg room is pretty adequate, however where it lacks is that this is strictly a four seater. Five adults are difficult to fit into this car because the width of the Ecosport is the least amongst all the other SUVs. 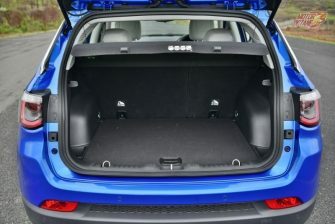 The boot is adequately big and the boot lid swings out instead of lifting up and hence this allows for easy luggage loading, due to the loading lip being low as well. The Maruti Vitara Brezza gets all black interiors that looks sporty. The fit and finish of materials is also good however, the quality could have been better as it feels a bit flimsy in certain areas. The dashboard layout is quite convenient and you have things falling in the right places. The touchscreen is located conveniently and tilted slightly towards the driver. The steering has good amount of controls and the instrument cluster is easy to read. The steering wheel is the same which is found on a range of Maruti cars so this doesn’t feel different. The seats would have been more supportive and they are very average. The armrest is very small and not very comfortable however, the good part is that you sit high in the vehicle and it gives you a commanding view of the road. 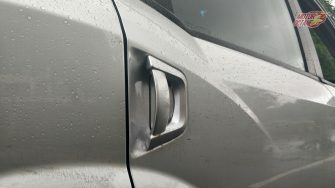 The C- pillars are thick so that intrudes in all round visibility but if you buy the top and variant, you get a very good reverse camera and it helps you in parking. Storage spaces are also plenty in the Brezza – bottle holders ,cup holders you also get two glove box compartments, one out of which is a cooled one. The rear seats of the Brezza are decently spacious however they are not very comfortable. Knee room also pretty fine and three adults can just fit in, but they will not be very comfortable. The rear headrests are adjustable and it also gets an armrest. the seats split 60:40 which is convenient but it lacks a rear AC vent and also power charging sockets. The boot of the Vitara Brezza has only 320 litres of space which is the smallest in this comparo. The Honda WRV is derived from the Jazz and for the interiors this is a boon. Though the interior layout is similar, it gets some new features like a touchscreen, which in your opinion is good to use. It also gets a sunroof which many customers nowadays prefer and the WRV is higher than the Jazz ,hence, while driving you do get an SUV kind of a feel. The dashboard layout is quite simple. There is a touch based automatic climate control system, the dials are easy to read in the instrument cluster and the steering is nice to hold and gets controls for audio and also cruise control, which is available only on the diesel. The seats are very comfortable just like other Hondas, however the highlight of the WRV is its all round visibility, which is amongst the best. It has the largest glass area so it feels more airy as well. There is good amount of storage space available, you have big cup holders, the door pads also can take 1 litre bottles, there’s a cup holder next to the AC vent, which helps you keep your drink cool. The rear has got lots of space but it is not as comfortable. It gets fixed headrests, the thigh support could have been much better. The WRV also misses out on the magic seats that are available in the Jazz and the back rest also does not recline. 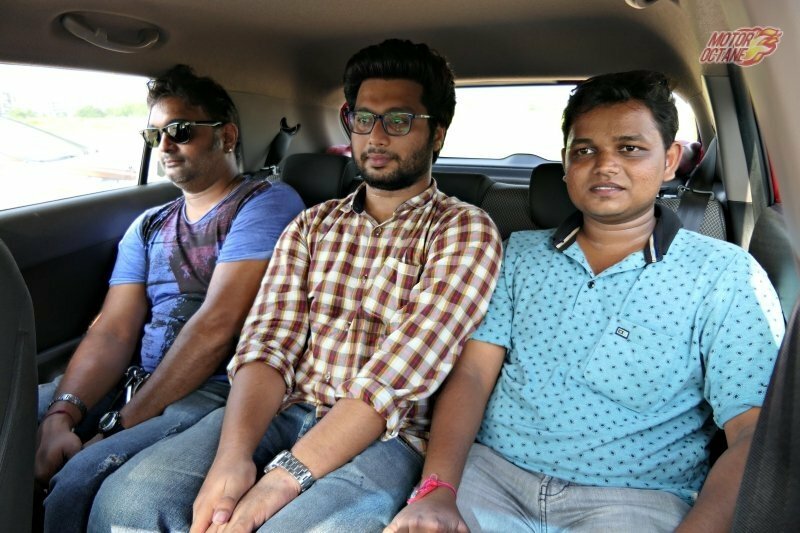 Three people can sit in the WRV as the width is good, but it lacks that comfort, clearly the focus is on the front passengers. It doesn’t even get 60:40 split for the rear seats. The boot space is 363 litres and it has got a low loading lip, so this is one of the best boots the segment. 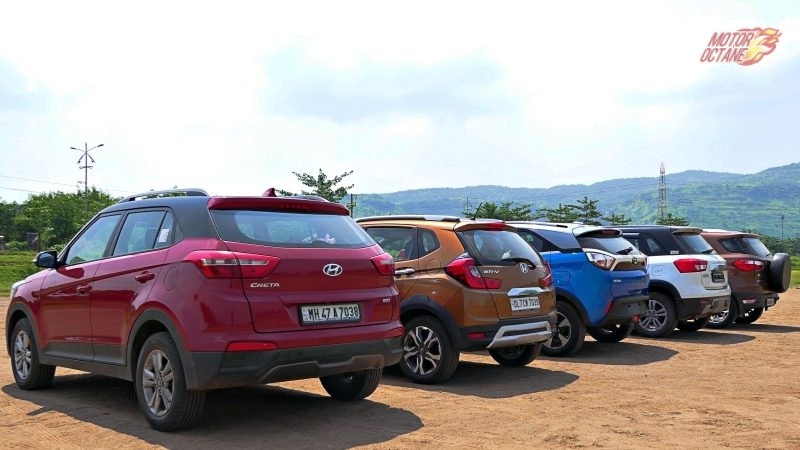 Coming to the Hyundai Creta, it is more than 4 metres in length, hence cannot directly compete with the rest of the SUVs which are smaller and also because it costs higher. But as SUV buyers also consider Creta in their probable list, we have included this one in the comparo. We have only considered the 1.4 litre Creta, as it is cheaper than the 1.6 version however, it also gets less number of features. To start with it does not get push button start and also comes only with a manual AC. It does get a touchscreen system and steering mounted audio controls. The dashboard layout is also clean and uncluttered. The seats are wide enough, however the lumbar support and thigh support could have been much better. The Creta also is high on storage spaces. 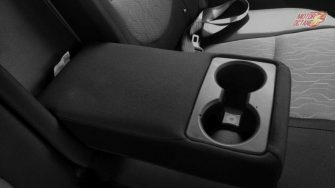 The floor console has cup holders and a storage space in the armrest. The door pockets are also big enough and a glove box also is pretty large. You sit pretty high in the Creta and it also is the tallest amongst all other compact SUVs. The rear of the Creta is spacious that is primarily because the length. The rear comfort levels are not bad the angle of the backrest is good. It also gets a rear armrest and three people can sit but with a little squeeze. There are rear AC vents and also a 12 volts power socket. The middle passenger has an integrated headrest, whereas the other two get adjustable headrests. The boot space is 400 litres, which is a little more than the WRV and easily the biggest one. So in terms of practicality the Creta scores high. 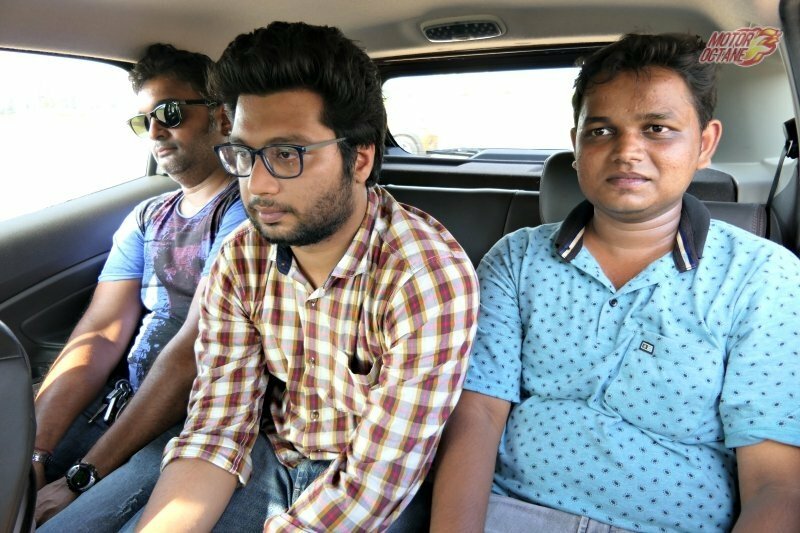 Then we come to the Tata Nexon. The interior is a big step up over the Tiago and Tigor. The fit finish and layout of a dashboard is good. It feels sporty and the touch and feel of materials is good. The steering wheel is the same found on other Tata cars and the instrument cluster is shared with the Tiago. 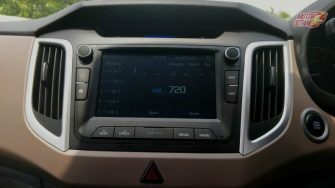 The touchscreen system in the Nexon is pretty cool as it gets a floating top touch screen that also falls in line with your vision. 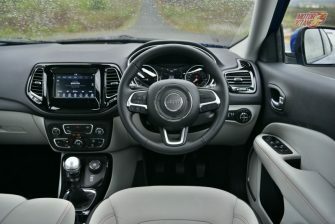 The touch screen is good to use and has buttons on the centre console. However, the camera quality is not so good and could have been better. The seats are nice and soft and provide good comfort. The bolstering is pretty good, not the best though. The armrest is located conveniently and adds on to the comfort, however, the steering adjustment has only got tilt and not a telescopic adjustment. The Nexon has a thick A pillar and when you drive on curvy roads or ghats, you have to adjust yourself for best visibility. In terms of practicality this is one of the best. Storage spaces are plenty. You get cup holders, the door pockets have space for water bottles and also a small umbrella holder, which is not much useful though. The armrest also has got storage space. 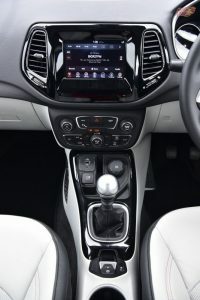 Talking of the rear, the Nexon also focuses on the comfort of the rear passengers. There is good amount of space available, the seat angle is also good, sufficient leg room and head room is available. It also gets a centre armrest and adjustable headrests. You also get a rear AC vent and it also has blower control in it. Also, the Nexon is the widest compact SUV, hence three people can sit very comfortable in this one. This is the most impressive feature. The boot has 360 litres of space which is more than sufficient and the seats also have a 60:40 split fold which makes it very convenient. So in terms of rear comfort, practicality and space, Nexon comes out on top. Ford Ecosport is the only vehicle which gets 3 engine options. It gets a 1.5-litre petrol with five- speed manual gearbox and also a six-speed dual clutch automatic transmission. Then there is a 1.5-litre diesel with 100bhp of power mated to a five-speed manual gearbox. iI also gets a 1.0-litre Ecoboost turbo petrol engine which is mated to a five-speed manual gearbox. Ecoboost is a turbo petrol and is also expensive, costing almost as much as the diesel. The petrol 1.5-litre is a decent car to drive in the city, moreso as it also offers the option of a of six-speed dual clutch automatic transmission that makes it very convenient. Howeverm the best package is the 1.5-litre diesel engine which is a very good performer, both in the city and on the highway. It has good driveability too, be it the city or the highway. The Maruti Vitara Brezza comes only with one engine option, which is the 1.3-litre diesel engine. It churns out around 90bhp of power. It offers very good performance, especially for the city and the instant response from stand still is also impressive. The Brezza also offers good driveability and you don’t need to shift gears frequently. Highway cruising is also fine at around 120km/h, however brisk overtaking on the highway is not its strength. The Honda WRV has two engine options 1.2-litre petrol and a 1.5-litre diesel. These are the same engines that are also found on the Jazz, but they get some tweaking, to be able to perform better with the added weight. The petrol engine is very refined and that is its highlight. It has decent power for the city use, but falls short if you are looking for some spirited driving or overtaking at high speeds on the highway. The diesel engine in the WRV is the more powerful one. It has almost 98bhp of power and comes mated to a six-speed manual transmission. This is it is a brisk performer and is good to use in the city and the highway. The engine is an all aluminium one, hence it is light and is known to be fuel efficient as well. The only drawback is that this engine is very noisy and that disturbs the overall NVH levels inside the car. The Hyundai Creta 1.4 develops 90 bhp. This engine has decent power but not the best, when compared to the Ecosport, WRV or the Nexon. However, it has driveability and you don’t need to change gears frequently while driving, which is best suited for city driving. It also comes mated to a six-speed manual transmission. The Tata Nexon has two engine options -1.2-litre turbo petrol which has around 108bhp of power and 1.5-litre diesel, which has again 108bhp of power. The petrol engine comes mated to a six-speed manual transmission, which is the first in the segment. 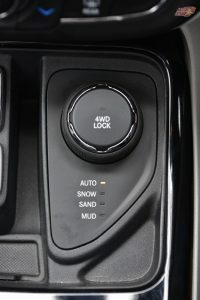 The diesel also has a six-speed manual. Both engines have been derived from the Tiago, but the good thing is that they are pretty silent and the overall NVH levels of the Nexon are the best and has minimal tyre noise. Petrol has decent performance, though not outrightly powerful, it gets the job done. It drives well on roads and we only had a little issue only on steep inclines or ghats, where the engine felt to struggle a little bit. However, working the gears properly will have it running well. The diesel is the more powerful one out of the two. It comes with good driveability and is responsive to drive. The Ford Ecosport has been our favourite in the handling department. 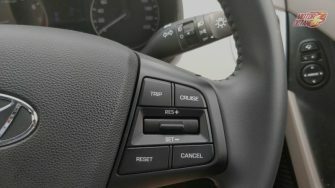 It is quick to respond to inputs and feels very agile too, thanks to the Fiesta underpinnings. The steering feedback is good too, though being an electric unit. The only issue here with this one is than it has a stiff suspension, so the ride quality is a bit on the harsh side. One will not feel this so much in city, but to long drives, this can get tiring. The clutch action also could have been lighter. The Maruti Vitara Brezza has a softer ride compared to the Ecosport. Initially it does not feel as planted, but after a while you realise that at high speeds and sharp bends, it actually has better control. This is possibly due the longer wheelbase of the Brezza as compared to the Ecosport. The suspension is well-balanced, despite the high ground clearance. The clutch is also on the lighter side, so there is not much fatigue in city driving. But where the Vitara Brezza loses out is in the steering feedback. I have observed that Maruti has neglected this aspect in most of their vehicles. The steering feels artificial and though the weight is decent, the steering does not auto correct itself. 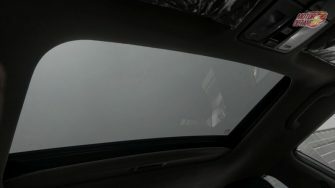 Another downside of the Brezza is its cabin noise. There is a lot of wind and tyre noise that seeps in, along with the engine noise. The Honda WRV gets a new suspension package as compared to the Jazz and has a pliant ride. On bad roads also it didn’t have much of an issue. The steering feedback of the WRV is the best in the segment. It is very responsive and sensitive to inputs. Even on winding roads, the body roll was well contained. NVH is good in the petrol version , but gets bad in the diesel, primarily because of the noisy diesel engine. The Hyundai Creta has a decent ride, thought not the best here. It is good on flat roads but does feel a bit unsettled on really bad roads. The handling also is good for city driving and also poses no problem on twisties, however that joy factor and feedback from the road is missing. 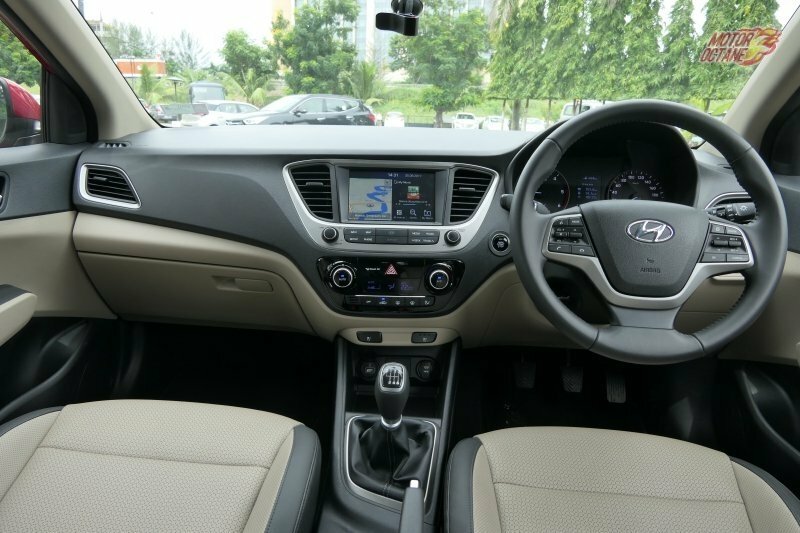 The steering though is very smooth and light for city driving and it is much improved over some other Hyundai cars. The cabin is quite silent. 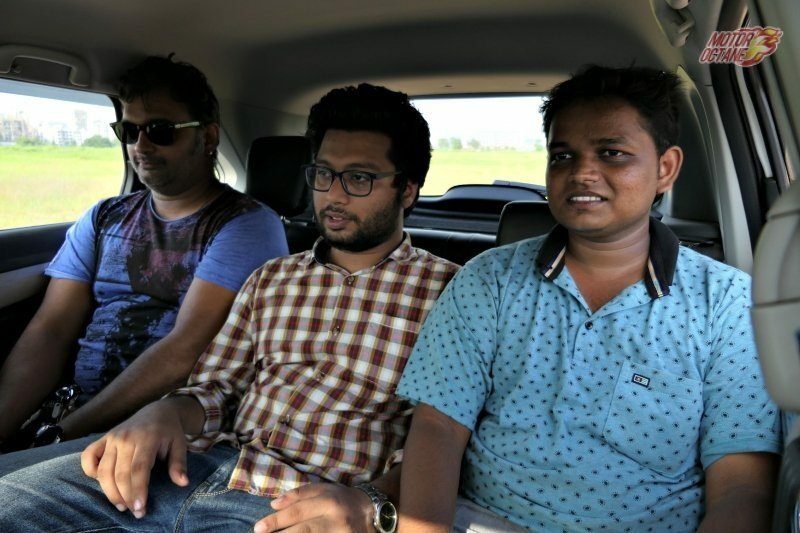 The Tata Nexon has impressed us in this department. Like always, Tata offers a great ride eevn in the Nexon. 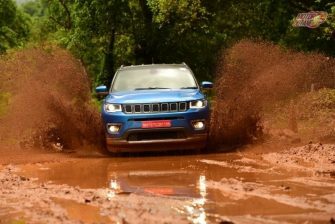 The suspension is well tuned to offer a comfortable ride and even bad roads or deep potholes are soaked up briliantly. The handling also is fine. Steering feedback is good, with proper weight. The steering wheel is also small in size, giving it a sporty feel. NVH is where the Nexon beats the rest of the SUVs here. It has excellent sound damping and there is minimal tyre noise and hardly any wind noise. The diesel engine is audible only at higher revs, which is acceptable. In terms of ride, the Nexon takes the cake and in handling the WRV, Nexon and Ecosport are the ones too choose. 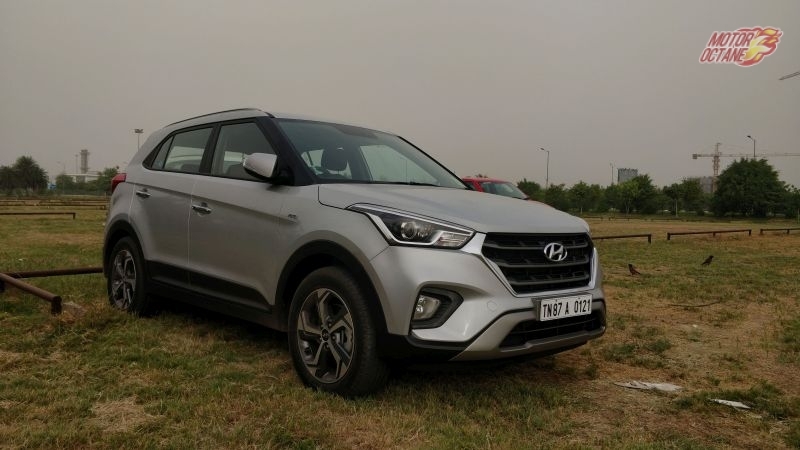 The Hyundai Creta 1.4 though not a compact SUV of this segment, has been considered for the comparo due to requests from our readers and also because people do consider having a look at the Creta too, while buying a compact SUV. The Creta 1.4 is a good overall package, considering its offering, but its value falls when you compare the price with others in this segment. It costs approximately ₹ 2 lakhs more that the rest. The Ford Ecosport is a strong product and ticks many boxes too. It has also been a favourite for many buyers. However, it is priced high and is also not a proper five seater. The base variant gets only one airbag. The starting price point of the Ecosport is higher than the rest as the petrol version is a 1.5-litre unit as opposed to a 1.2-litre in other petrol SUVs of this segment and even the diesel is pricier. Hence the Ecosport loses out as a value for money proposition. 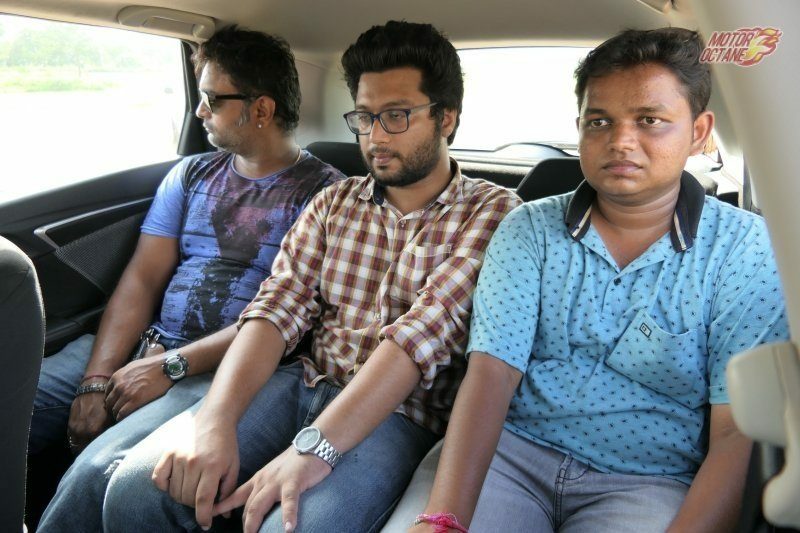 That leaves us with three others which are the Maruti Vitara Brezza, Honda WRV and Tata Nexon. All three are very good value for money products. There is little to complain in the Vitara Brezza, except for things like NVH levels, steering feedback and rear seat space and comfort, as compared to the WRV and Nexon. It also offers the least warranty, which is 2 years / 40,000 kms as opposed to 3 years offered by the rest. If you are considering a petrol version, then the WRV marches ahead as it offers a more refined engine with decent performance and mileage and also as an overall package, including features like a better touchscreen, sunroof and the kind of space it offers. But when it comes to diesel, we feel the Tata Nexon beats the rest as it is a brilliant combination of performance, refinement, ride and handling, space and features. The Nexon also has a service interval of 15,000kms (first in the segment), which may bring down maintenance costs. Price of the Nexon is not yet announced, hence this evaluation is based on the hypothesis of the Nexon being even ₹ 50,000 more expensive than the Vitara Brezza or WRV. A mega comparison of the compact SUVs. This will help make a choice of the best suited vehicle for you. Please add TUV 300 also in comact SUV segment and compare. Request you to advise which one to buy in top end model of Suzuki S-Cross 1.3 or Tata Nexon Diesel. Running is 50 kms\day in city & 500 km\month on highway. Would like to read a comparison between the Nexon and the Crossovers like S Cross, i20 Active, Etios Cross etc. as well. The most awaited and the most sort after comparison for many of you SUV lovers has been finally compiled. 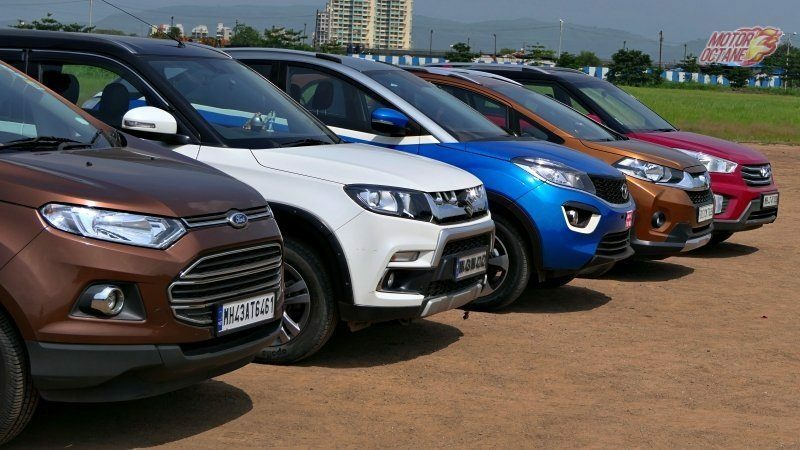 Note all cars here are going to be compared based on the top variants in which they are offered. Tata Harrier’s price has also been revealed. It will start from Rs 12.69 to Rs 16.25 (Ex-showroom). Below we shall check out the specifications, features and pictures showing us the design of these cars. After all this information has been checked, do let us know in the comments, which car would you prefer. 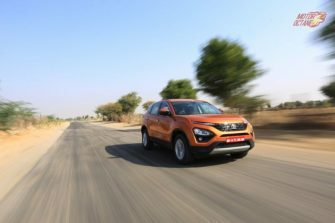 So let’s begin this SUV showdown which will be the Tata Harrier Vs Jeeps Compass Vs Mahindra XUV500 Vs Hyundai Creta. Simply the ‘King of The Hill’ in this segment. A robust package that is full of feature. A flawless 1.6-litre engine. Maybe the design is getting old. This car too was facilitated this year. It’s powerful. Well packaged. And was till now the best looking car here. 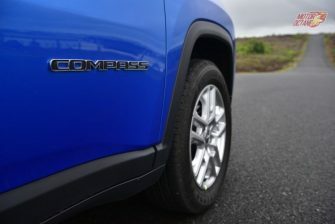 But that aside, the Compass with its proper 4×4 system can really go off-road in style. The price of this car is it’s Achilles Heel. And finally, the latest entrant! 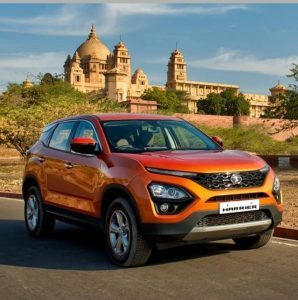 The Tata Harrier. The most awaited car of the year. The price has now been annoubced. 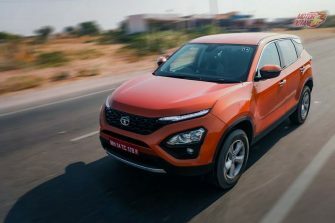 Sure some features are sure missing ,but overall this car with it’s high localization, features, specs and great design will finally be the worthy challenger to the King of the Hill, the Hyundai Creta. Now lets take a look at the below stats. The features and specifications are compared keeping in mind the top variants of each car. And while all is discussed the price of these cars is something that will make us all dwell. The Tata Harriers price is going to be a very key aspect in this comparison and we are going to eagerly wait for this cars launch and get to know the price. Now design, be it the interior and exterior of the car is a very subjective term. Some might like it and some might not. 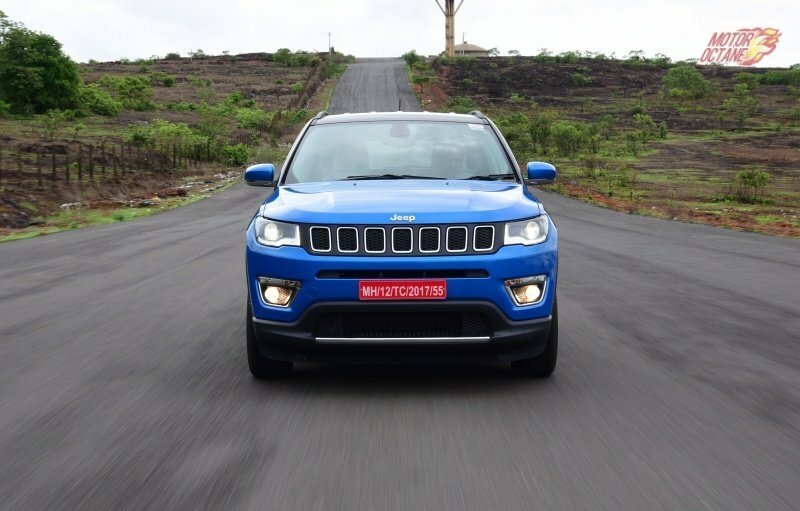 For example, the Harrier looks the most appealing car genrally in this bunch but some people really like the proportions of the Jeep Compass and others like the bulky and heavy look of the Mahindra XUV500. The name Innova is synonymous with utility vehicles in India. The completion has never managed to come close to the Innova in terms of sales and popularity. 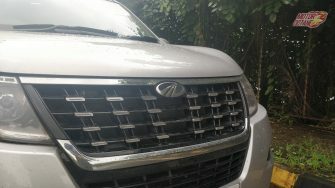 Tata had tried to challenge the Innova with the Aria, however it did not achieve much success. The new Toyota Innova Crysta came as a new generation vehicle and offers more options, better features and space. 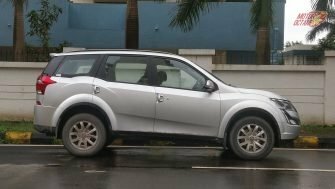 Tata too has upped its game and had launched the Hexa. The Tata Hexa competes squarely with the Toyota Innova Crysta. 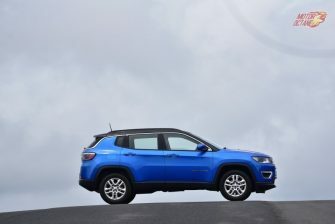 Both the MUVs offer good features, are spacious and also high on utility. They both also offer an automatic transmission. Both vehicles set a new benchmark in this segment in terms of looks, styling and features. 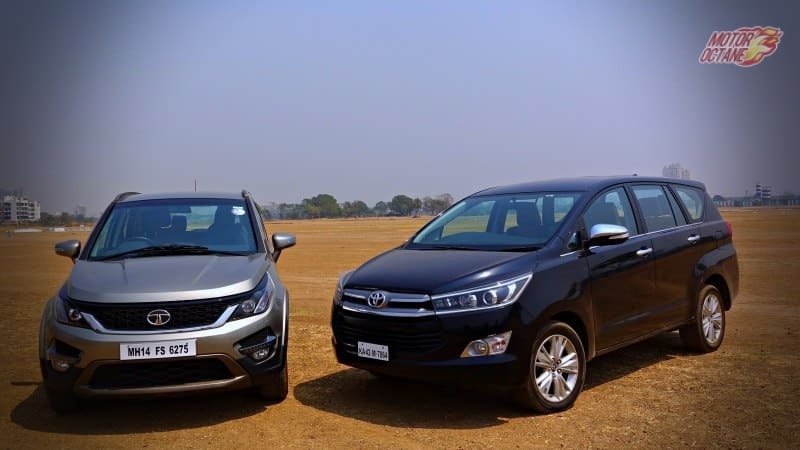 Let’s see the Tata Hexa vs Toyota Innova Crysta comparison. Toyota Innova Crysta doesn’t just have a higher price but it gets additional features too. The Japanese MUV feels more premium than the Hexa on the inside. Maruti DZire 2017 vs Maruti Baleno – Which to buy? 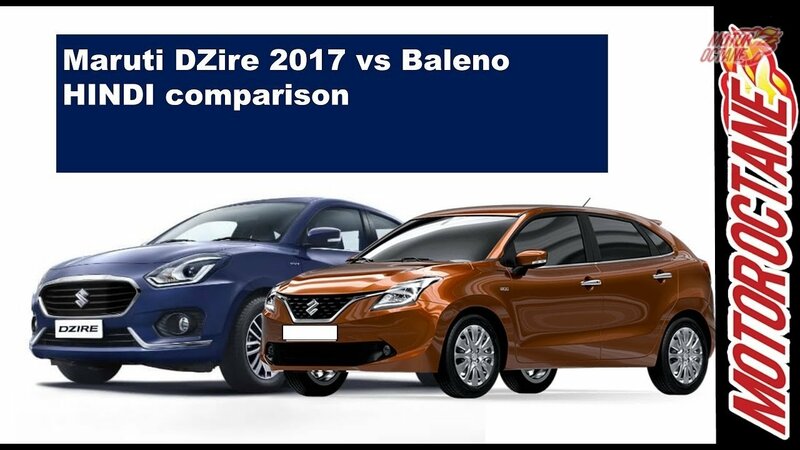 Maruti DZire 2017 vs Maruti Baleno is a common comparison for new car buyers. This will be an exciting comparison as they have siilar pricing. 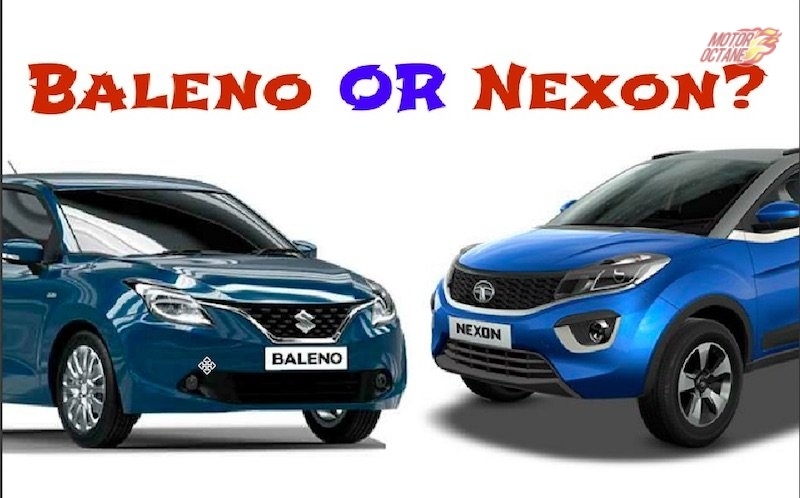 Tata Nexon vs Maruti Baleno – Which should be you buy? The luxury sedan segment has seen some action lately. This segment of ₹ 25-40 lakhs had turned drab sometime back as buyers had shifted their focus towards SUVs. However, with the recent launches and product updates, it seems that buyers are returning to buy these cars,though not so high in numbers. The Volkswagen Passat, which was withdrawn from the market has been relaunched recently. 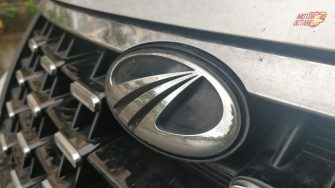 We compare it to another updated product in this segment which is the new Skoda Superb. How do these two compare? Which one should you buy? 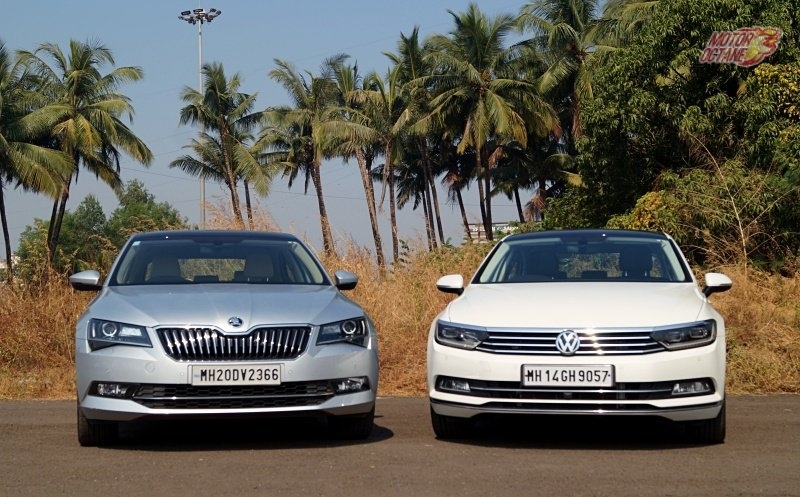 We tell you in the Volkswagen Passat vs Skoda Superb Comparison. The new Volkswagen Passat takes on the Skoda Superb. This is a comparison of both cars to help find out the right choice for you. The Hyundai Verna 2017 was recently launched with a lot of fanfare. This doesn’t come as a facelift, but is all new car which boasts of a new platform, more refined engines and new transmissions. Not only that, even the look of the car is very different. Needless to mention the features which are now even more than earlier. The sedan segment has always been dominated by the Honda City. The earlier generation Verna gave it some competition but couldn’t dislodge it. The Maruti Ciaz then came and also has been a tough competitor since then. We compare the 2017 Hyundai Verna to the segment leaders Honda City and Maruti Ciaz. Let’s see how these three compare and which one would be the right choice for you. 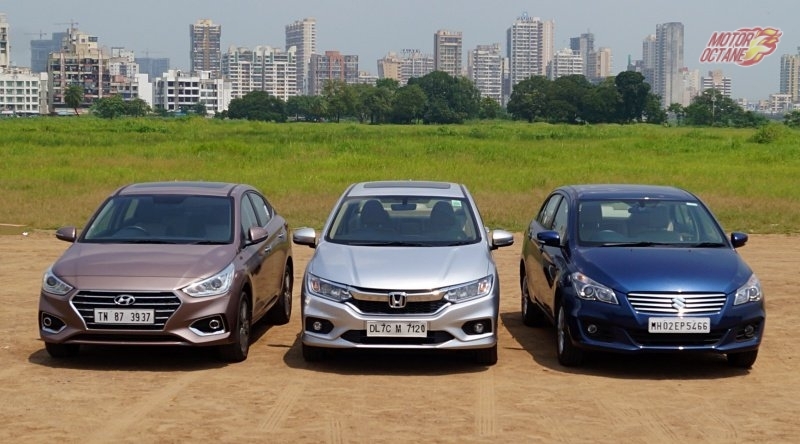 Read further to more about the 2017 Hyundai Verna vs Honda City vs Maruti Ciaz comparison. The 2017 Hyundai Verna challenges the Honda City and Maruti Ciaz. Which is a better choice? We tell you. The Renault Captur has been unveiled. This is the the latest SUV from Renault and is expected to be positioned in a premium way. 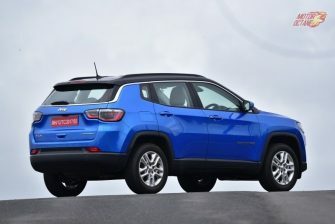 It is built on the Duster platform and also shares its drivetrains with the Duster. 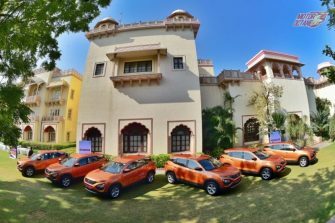 Another new sub-4 metre SUV in the Indian market is the Tata Nexon, which has recently been launched at a very aggressive price point. We compare these two SUVs, though they are differently positioned, but come with similar crossover genes. Which one is ideal for you? 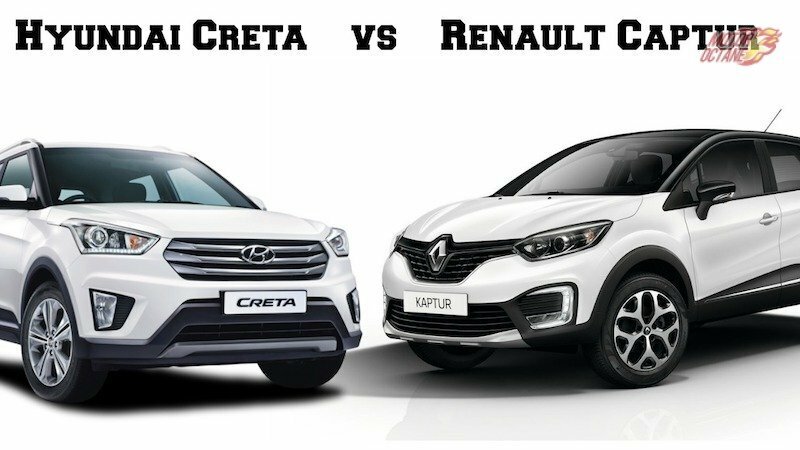 Read further in our Renault Captur vs Tata Nexon Comparison. Renault Captur vs Tata Nexon brings out what each of these SUVs have to offer. Both are good looking vehicles. Hyundai Verna 2017 is an all-new car which has been recently launched in the Indian make. This is the new generation Verna which offers much more than before.Always know to be a feature loaded car, the Verna continues this practice. It shares its platform with the Elantra, on which it is built. The Hyundai Creta has been one of the highest selling SUVs in its segment. One of the main reasons is that it offers a range of engine and gearbox options and also good number of features that customers desire. Both are desirable vehicles and fall in overlapping price brackets. So which is suitable for you? Know more about it in the 2017 Hyundai Verna vs Hyundai Creta Comparison. 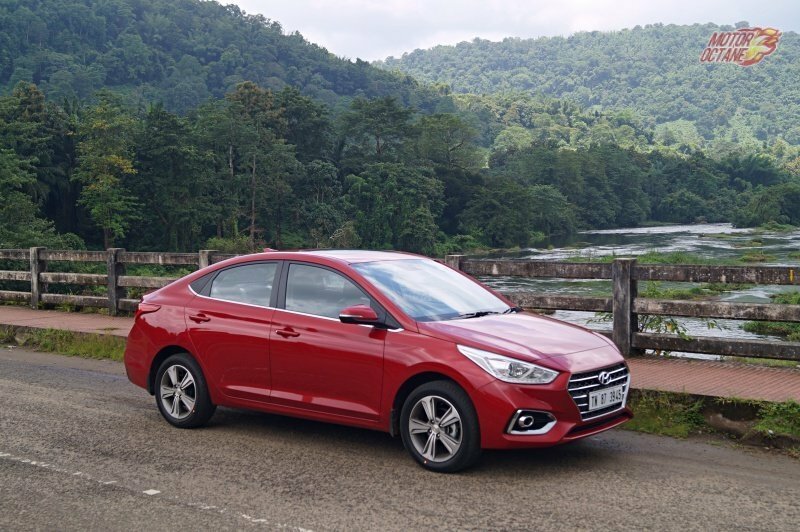 The New Verna now looks mature and has an all-new look. The car looks much more evolved. The headlamps are sleek and the grille gets chrome slate, though only on higher variants. 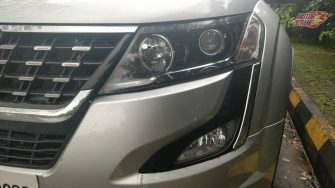 Projector headlamps are now seen in the car and it and also gets LED DRLs. The design is inspired from a coupe and hence it looks suave as well. The silhouette has clean lines flowing across.The mid models have 15-inch steel/alloy wheels and the higher ones have 16-inch diamond-cut alloy wheels. This is what makes the Hyundai Verna 2017 a lot more stylish and attractive. The Hyundai Creta has a boxy design, like most SUVs have. There is a large front grille with chrome on it. The headlamps are rectangular with projector headlamps and daytime running LEDs. There is a lot of chrome on the front to make it look premium. The side profile is boxy and door pillars. Higher variant gets 17-inch wheels and these are diamond cut alloys. Lower variants get 16-inch wheels. 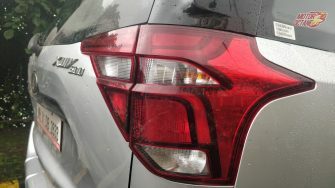 The rear continues to have large and sleek tail lamps. 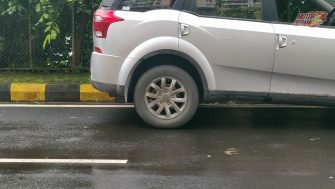 The number plate is located on the rear bumper and this makes the Creta look tall. Also Read: Maruti Ciaz facelift coming. 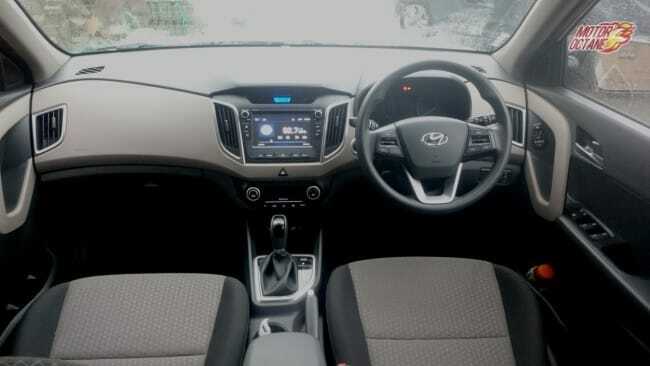 The cabin of the Verna has a rich and premium feel. Dual tone theme with beige and black makes the car feel quite airy. The dashboard is of a neat design. The 7-inch touchscreen come equipped with MirrorLink, Apple CarPlay and Android Auto, reverse camera and a navigation system. The car also gets front and rear USB charging. The top model has 6 airbags on offer. The boot also has hands-free opening option. The Verna has similarities to the Elantra. Tall passengers will not have any problems. The rear seat offers decent space. It isn’t very tight, but just sufficient for tall people. At the same time, there is sufficient knee room and just enough head room. However, three people will find it a bit of squeeze. Boot space is 480 litres, which is good. Hyundai Creta has black and beige interiors. There is a 7-inch touchscreen system with Android Auto, Apple CarPlay and a large touchscreen infotainment system. There is navigation and even reverse camera, while there are four speakers and two tweeters also on offer. Dual airbags and ABS are a standard feature. Top-of-the-line variant gets leather upholstery too. Creta has spacious interiors, but these are similar to the Duster in space. The boot is about 400 litres, which is just fine for a vehicle of this size. The boot does not have a hands free opening feature. The Hyundai Verna comes with 1.6-litre petrol and diesel engines. the 1.4-litre engines have been discontinued. Both engines are good performers and now their driveability has also improved. These engines are mated to 6speed manual and automatic transmissions. Hyundai has offered options of automatic in both petrol and diesel, which is excellent. The Hyundai Creta is available with a 1.6-litre petrol engine and 1.4-litre and 1.6-litre diesel engines. The petrol comes with a 6-speed manual and auto transmissions and the disel has a 6speed manual and the 6speed auto comes only with the 1.6-litre engine. Both the Verna and Creta offer good performance across their range. 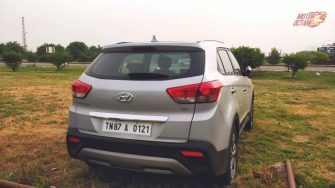 2017 Hyundai Verna vs Hyundai Creta: Which to buy? Its simple. Both these vehicles are extremely competitive and buying any one will not be a wrong choice. If you frequently travel on bad roads, or rural roads, where one requires a high ground clearance,or if you like to sit tall in a vehicle, then the Creta makes more sense. But if you drive mainly on good roads, in the city or highway and prefer a more sporty and suave looking car, with more number of features, then it is of course the Verna that will be a better choice. Hyundai Verna and Hyundai Creta are different vehicles that fall in similar price brackets. Find out which will suit you more. Skoda Kodiaq is the new SUV from the Czech manufacturer. 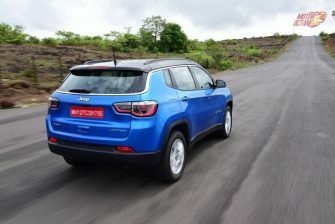 This is an all-new seven-seater SUV that is being launched in India this year. The Skoda Kodiaq is underpinned by the MQB platform of Volkswagen and this SUV will be assembled in India. One of Kodiaq’s main rivals will be the Ford Endeavour. The Ford Endeavour reminds one of the classic American muscle trucks. This is a ladder -on-frame construction and has its inherent strengths of durability and ruggedness. It doesn’t have a jazzy styling but looks premium. It comes with a new trapezoidal front grille which has horizontal slats. How do these two vehicles stackup? 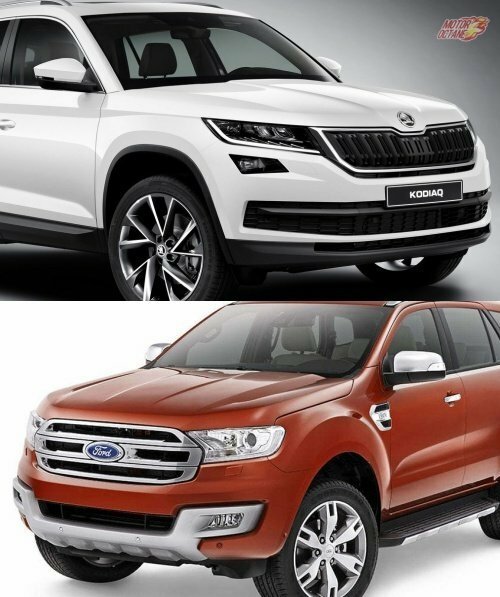 Read further in our Skoda Kodiaq vs Ford Endeavour Comparison. The upcoming Skoda Kodiaq will challenge the Ford Endeavour. A comparison that details what these both comprise of. Skoda Kodiaq is the new SUV from the Czech manufacturer. 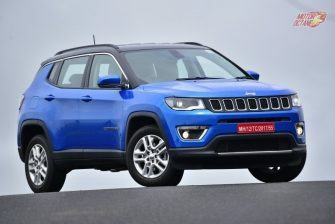 This is an all-new seven-seater SUV that is being launched in India this year. The Skoda Kodiaq is underpinned by the MQB platform of Volkswagen and this SUV will be assembled in India. One of Kodiaq’s main rivals will be the Toyota Fortuner. The new Toyota Fortuner is an all new vehicle, built on a new platform. It is much improved over its predecessor and comes with more space, features and modern looks. How do these two vehicles stackup? Read further in our Skoda Kodiaq vs Toyota Fortuner Comparison. The Skoda Kodiaq will challenge the Toyota Fortuner. Which one is more suitable for you ? The Ford Ecosport 2017 will be launched this year. Although it is not an all new vehicle, it will get many changes inside out. The Ford Ecosport will look different as well. The front portion will be all new. The rear will also see few changes. A new 1.5-litre petrol engine will do duty and the dashboard will also carry many changes. The interiors will be refreshed and there will new features offered. 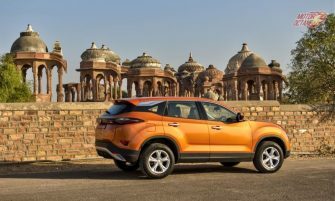 Tata Motors will also be launching their first compact SUV which is the Tata Nexon. This has a monocoque chassis as well. 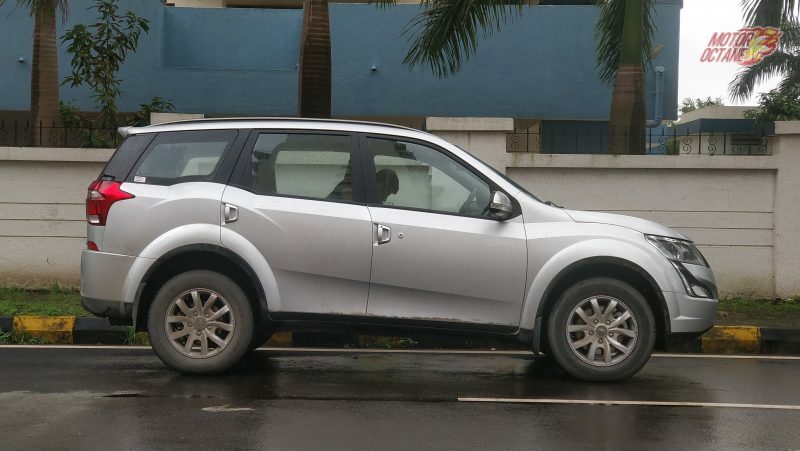 This SUV is made on the X1 platform, which it shares with the Zest and the Bolt.There are several first in class features on offer and many for Tata cars too. 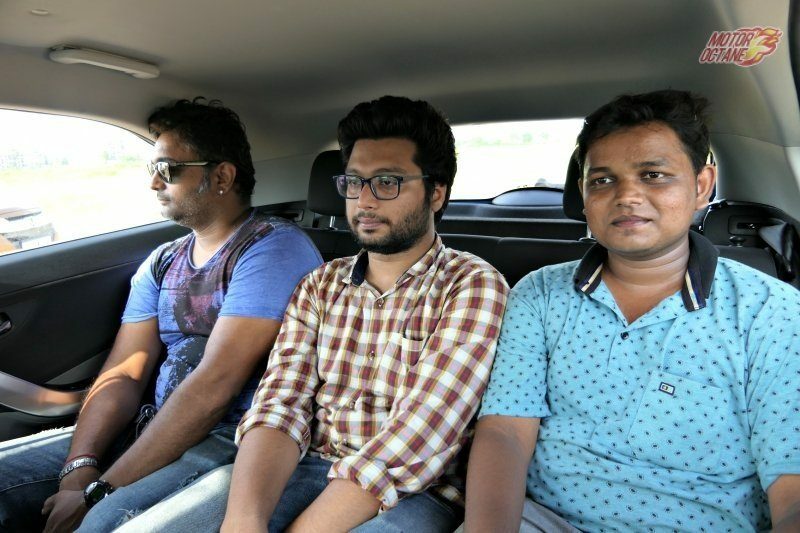 The Nexon is a promising vehicle and is very spacious too. The Nexon will come with 2 engine options. 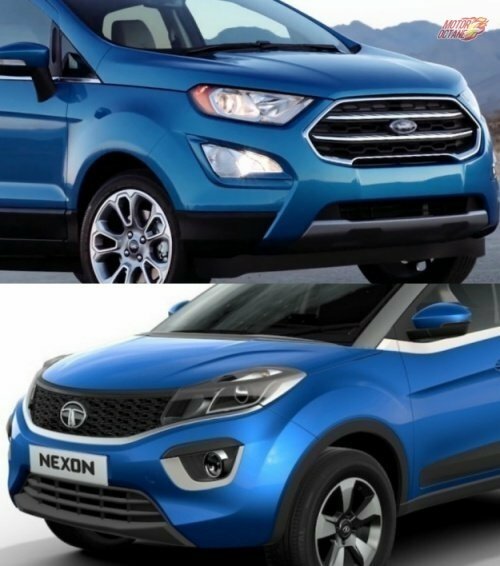 Let’s see how these compare against each other in our Ford Ecosport 2017 vs Tata Nexon comparison. 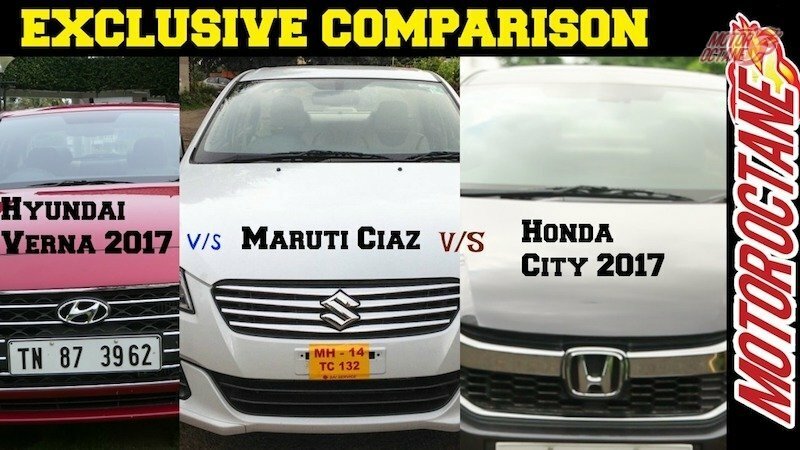 Hyundai Verna 2017 vs Maruti Ciaz vs Honda City 2017 is a close battle between 3 sedans that are fighting for a constantly reducing segment. Renault will soon be launching its all-new SUV, the Captur. The Captur will be positioned above the Duster, which is the company’s best selling SUV at the moment. Duster was the one to start the compact SUV segment and it went on to became a roaring success. Renault would like to repeat the same with the Captur. 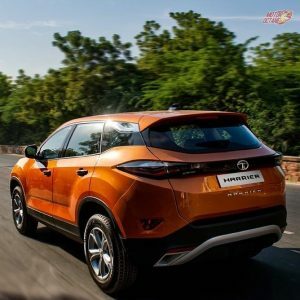 However, the segment that Captur will come into, is already having some established players and one of them certainly is the Mahindra XUV500. Will the Captur be able to challenge the popular XUV500? 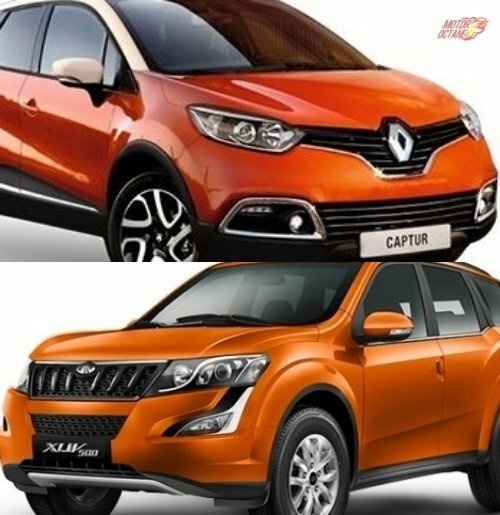 We find out in the Renault Captur vs Mahindra XUV500 Comparison. Read on further to know more. Renault Captur vs Renault Duster are two SUVs from the French automaker. The Duster began its journey as a Dacia and now as a Renault it gets some additional features too. The Captur is more of a modern SUV that is rugged like the Duster but comes with a lot of frills. The Renault Duster and Captur are two good options to consider. Which one should you buy? Renault has just announced the launch of its new SUV, Captur. This will be launched by October. Renault Duster hasn’t been doing well for the French automaker since the entry of Hyundai Creta. It is looking at countering the premium looking Korean SUV with this. The Captur is bigger than the Duster, looks more urban and modern and even offers more features and space too. 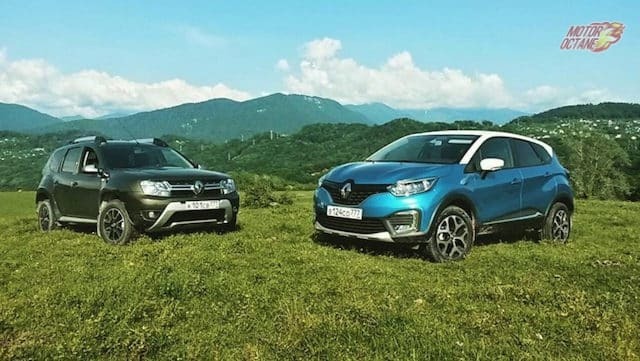 Renault Captur vs Renault Duster Comparison is a the competition of the two family members looking at outdoing each other.